A wave of protest marches and information events against the Transatlantic Trade and Investment Partnership (TTIP), the Canada-EU Trade Agreement (CETA), and the Trade in Services Agreement (TISA) yesterday swept across Europe, the US, Canada and number of other countries. On the eve of the 9th TTIP negotiation round set for New York (20-24 April), thousands took to the streets in the European capitals of London, Brussels and Helsinki. In Munich, which had seen 10,000 march to successfully bring down the Anti-Counterfeiting Trade Agreement (ACTA), an estimated 20,000 protestors took part in what was the largest event in Germany. 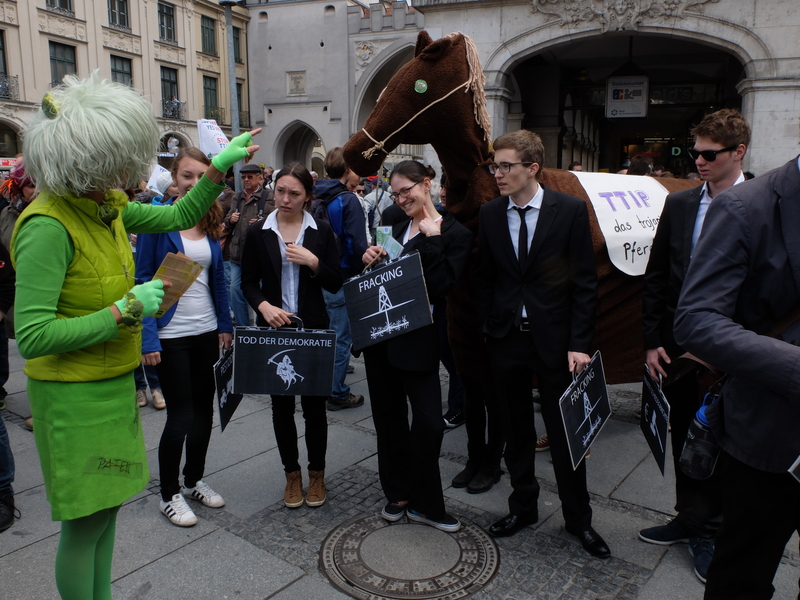 “We must not be enslaved by big money,” Prof. Hubert Weiger, chairman of the German environmental organization BUND, warned during the Munich march. The influence of lobbyists is one of the major concerns of the protestors and seen by many as a threat to democratic systems. At the Munich rally, agriculture was one of the big topics as Bavaria besides its high-tech industry still thrives in the marketing of locally produced food. Local farmers, in contrast to big agro-industrial concerns, would not benefit from the big trade agreements, warned a spokesperson of the Arbeitsgemeinschaft Bäuerliche Landwirtschaft, an interest group for small farms. The agreement would help to ship cheap soya from the US to Europe, send dairy products and receive back canned, liquid “cheese”. “We certainly can live without that,” he said. “We have to say no in the final vote,” said Maria Noichl, a Social Democrat (SPD) Member of the European Parliament. The European Parliament has to pass the trade agreements once they have been finalised by negotiators, along with the member state governments. Vice-Chancellor Sigmar Gabriel (SPD) as well as German Chancellor Angela Merkel (CDU) have declared their support for TTIP recently. Given the rising protests – 1.8 million Europeans have already signed a declaration against TTIP and CETA and around 400 organisations are campaigning against it – the outcome is still very much open. The Commission, which is gearing up for the next negotiation round, answered the protests today with another underlining of how transparent the negotiations are and pointed out what it sees as misunderstandings by the opponents. 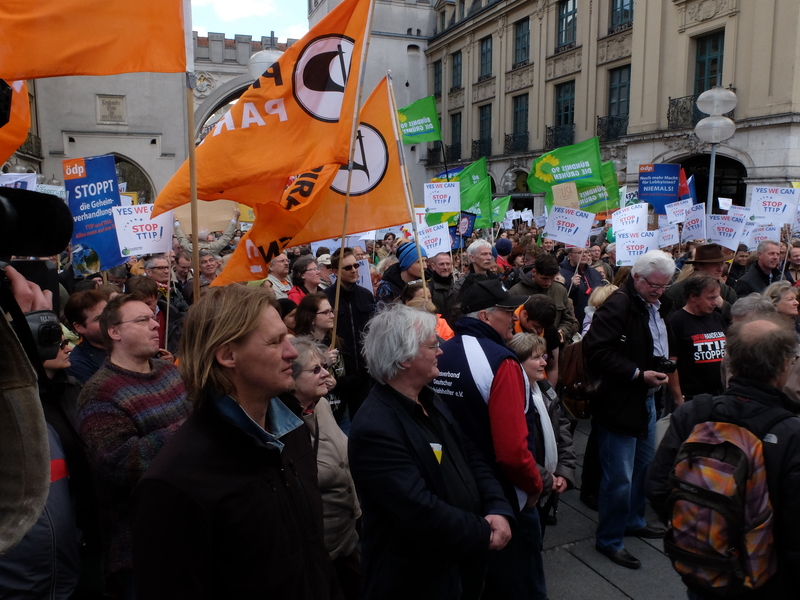 "Wave Of Protests Against TTIP, CETA, TISA" by Intellectual Property Watch is licensed under a Creative Commons Attribution-NonCommercial-ShareAlike 4.0 International License.